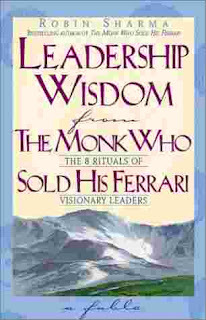 Just finished reading "Leadership Wisdom from the Monk who sold his Ferrari" by Robin Sharma. Actually finished reading it for the nth time! This book is about one can become a great Leader and provides practical, sensible Leadership sense. Actually, I couldn't wait to finish it so that I could share the lines from the book, that moved me the most. Besides his own wonderful fundas, he has also quoted various other people and I have mentioned some of those as well. 1. Immediately before a great victory, one will often experience some form of difficulty. The key is to maintain your focus and keep on believing. 3. Leadership is not about managing things but about developing people. 4. The visionary leader is one who has learned how to focus on the summit while clearing the path. 5. Purpose is the most powerful motivator in the world. 6. Great leadership precedes great followership. 7. Too many vision statements hang on office walls rather than in live in human hearts. 8. Visionary leaders care more about doing what's right than appearing intelligent. Leadership is not about popularity, it's about integrity. It's not about power, it's about purpose. 9. People who feel superb about themselves generate superb results. 10. The Law of Diminishing Intent says that the longer you wait to implement a new idea or strategy, the less enthusiasm you will have for it. 11. 'Principles are to people, what roots are to trees. Without roots, trees fall when they are thrashed with the winds. Without principles, people fall when they are shaken by the gales of existence.' - Carlos Reyles, Spanish philosopher. 12. When a student is ready, the teacher appears. 13. 'It is not because things are difficult that we do not dare; it is because we do not dare that they are difficult.' - Seneca. 14. Every time you avoid doing right, you fuel the habit of doing wrong. 15. Stop listening with the intent to respond. Instead, listen with the intent to understand. 16. Let rewards and recognitions flow freely. Remember, you always get more of what you reward. 17. Nothing motivates and focuses the mind better than a clear purpose. 18. Have the wisdom to understand that failure is essential to success. 19. If you are patient in one moment of anger, you will avoid a hundred days of sorrow. 21. Doing the same things every day will not deliver new results. To change the results you are getting, you must change the things you are doing. 22. The arrow that hits the bull's eye is a result of one hundred misses. 23. Knowledge that remains unapplied is worthless. Lasting success comes only through acting on what you know, putting it into practice. 24. Your mind can be either your best friend or your worst enemy. Don't let the weeds take over. Manage your inner morale. Assume full responsibility for attitude control. As you sow, so shall you reap. 26. The quality of your leadership can be ultimately traced back to the quality of your choices. 29. Visionary leaders have the wisdom to understand that if you don't lead your time, it will lead you. 31. If you don't act on life, life will act on you. 32. If your priorities don't get put into your planner, other peoples' priorities will get put into your planner. 33. It's not what you know that matters. Success comes from acting on what you know. 34. The greatest battles we fight take place within ourselves. 35. The tougher you are on yourself, the easier life will be on you. 37. Let time be your servant rather than your master. 38. There's nothing wrong in making a mistake. Mistakes allow us to mature and become wiser. But there IS something wrong in constantly making the same mistakes. It shows a complete lack of wisdom. 39. The truth of the matter is that success is an inside job. Excellence begins within. Market leadership begins with self leadership. 40. Failing to devote time to the discipline of self-renewal is like saying you are so busy driving that you don't have time to stop for gas. 41. Don't be so busy striving to make a living that you forget how to live a life. 42. Stop wishing for fewer problems and start searching for greater wisdom. 43. The type of leader and the kind of person you will be five years from now will result from two primary influences: the books you read and the people you associate with. 44. It's not what you get out of books that makes the difference - it's what books bring out of you. 45. The person who doesn't make time for exercise must eventually make time for illness. 46. Never settle for mediocrity when you can attain mastery. 47. The Purpose of Life Is a Life of Purpose. 48. What makes greatness is beginning something that does not end with you. 49. Be ashamed to die until you have scored a victory for mankind. 50. When you were born, the world rejoiced while you cried. Your mission must be to live your live in such a way that when you die, the world cries while you rejoice. Well, I hope that a few of these gems have struck a chord with you, as they did with me. It’s worth going through the entire book (just 250 pages) to get the real feel of it. Anyway, have a great life .. and become a 'visionary leader' in your own right.